The B vitamins are necessary cofactors in an essential cellular process called the methylation cycle. In this cycle, all three B vitamins are used to convert a potentially damaging molecule called homocysteine into the useful amino acid cysteine. When levels of these B vitamins are low, blood levels of homocysteine rise—a situation that has been shown in numerous studies to significantly increase the risk for heart disease and Alzheimer's disease. Luckily, homocysteine levels can be kept in balance by eating a diet high in the following foods. Be sure to include food sources of B vitamins all year round! Some of us may need supplementation of specific B vitamins. If you would like to learn about ways to tailor your dietary needs to your personal constitution, please schedule a nutritional consultation here. Late summer: harvest time, abundance, peaches, plums, berries, and the first apples. Maple trees tinge red-gold and mornings are crisp and dew-dropped. Now is the time to enjoy this abundance. Feed your body. Feed your soul. In a large mixing bowl, zest the lemon and squeeze out the juice. Add the flour, baking powder, and salt. Add the oil or butter in pieces and smash into the flour mixture with a fork so that the fat is well coated with flour. Add the maple syrup and eggs / flaxseed, mix well, and spread into the pan. Arrange the fruit halves / wedges in concentric circles on top of the batter, lightly pressing them in. In a small bowl, combine the spices and 2 tablespoons maple syrup. Pour the mixture over the fruit and bake about 1 hour. These are wonderful foods to incorporate into your diet to boost immunity and curb sweet cravings. Sweet Potato: high in omega 3 essential fatty acids to tonify the internal organs and strengthen immunity; rich in carotenoids, whose anti-oxidant content offers anti-inflammatory support; high in vitamin C to boost immunity; rich in B vitamins to reduce stress. Black pepper: although it’s known for making you sneeze, black pepper can actually help to ward off the sniffles. Black peppercorns are high in piperine, a compound with anti-inflammatory qualities that can reduce swelling in joints. Piperine also helps you absorb the benefits of other spices.Try for 2 teaspoons of both black pepper and oregano per week to boost your immunity. Lime: both the skin and juice of this citrus fruit contain a natural flavonoid called hesperidin, which is shown to help combat cancer and ward off viruses and bacteria that cause the stomach flu. Avoid drinking undiluted juice to protect your teeth. Add lime to salads, water, or use it as a salt alternative when sprinkled on veggies. Tahini: a classic Mediterranean flavor, this peanut butter-like spread is made from ground sesame seeds. It contains two immunity-boosting ingredients: magnesium and zinc. Magnesium is essential for optimal immune function, while zinc protects against infection. Try tahini with hummus or in an open-faced sandwich with honey and apple. Preheat the oven to 400 degrees. Chop and roast sweet potato in sunflower oil and salt for 35 minutes. Meanwhile, whisk the oil, almond milk, maple and vanilla. Add the flours, spices, and salt. Once sweet potato is roasted, mash it with a fork and fold it into the batter. It can stay chunky. Oil 12 muffin cups, fill 3/4 full and bake for 20 minutes. Let muffins cool before serving. They are delicious with almond butter! Spring is a great time to simplify your diet. Start enjoying seasonal spring food and try to include at least 7 sevings of fruits and vegetables in your daily intake. Focus on meals comprised of 2/3 vegetables, 1/3 protein, and 1/3 whole grains. For protein, choose pastured poultry and eggs, white fish, yogurt, hard cheeses and beans. Enjoy whole grains such as millet, rice, buckwheat, bulghur (wheat), and amaranth. Depending on where you live, spring vegetables can vary. Look for these foods as they become available locally. They are high in antioxidants and fiber. Many of them help renew the liver, flush out excess toxins, and digest fats more effectively: asparagus, artichokes, broccoli, burdock root, celery, chicory, chives, dandelion leaf and root, endive, fennel, nettles, parsley and spinach. Incorporate more fruit into your diet! Try some of these delights: apples, dried apricots, blueberries, apples, oranges, and strawberries. Millet: alkaline enough to balance body’s pH; nutrient dense, hypo-allergenic, complex carbohydrate; offers a balance of B vitamins to support digestion and provide consistent energy. Nettles: rich in chlorophyll, fiber, flavonoids, tannins, plant acids and histamin, vitamins A, C, and many minerals, including iron, copper, and calcium. Parsley: depurative, anti-dandruff, digestive, emmenagogue, expectorant, odontalgic, stomachic, and tonic. rich in Vitamin C to decrease inflammation, beta carotene to help prevent infection and strengthen immunity, and folic acid (B vitamin) to support cardiovascular health. The activity of parsley's volatile oils qualifies it as a "chemoprotective" food that can help neutralize particular types of carcinogens as well as ease the burn of insect bites and stings. Soak ½ cup millet for 2 hours or so. Strain and rinse millet. Pour into a cooking pot with 2 cups water. Grease a large glass baking dish (9x13) with vegetable oil. Turn on the broiler. Pour millet into the baking dish and flatten it evenly. Broil for 5 minutes. Allow to cool and set. Take a bunch of beet greens, rinse them, and place them in a deep skillet with an inch of water at the bottom. Bring to a boil, covered, and reduce to simmer. Crack four eggs on top of the beet greens. Place lid on skillet and angle it to leave enough of an opening for steam to escape. Slowly poach the eggs on low heat for 5-6 minutes for soft yolks (8-9 minutes for hard yolks). Meanwhile, chop a handful of each of these fresh herbs if you have them: mint, basil, parsley, cilantro. Add fresh herbs on top of poaching eggs and steam briefly. Remove each egg from the skillet with a slotted spatula and place on plates. GET CREATIVE! Serve with toast or quinoa; drizzle of olive oil and lemon juice; use as a topping for millet waffles. Place olive oil in a soup pot and heat gently. Add the onion and sauté for 15 minutes on medium heat. Add leeks, celery, carrots, potatoes (if using), and zucchini. Sauté for 5 more minutes. Add water and herbs. Bring to a boil. Reduce heat to medium and cook, covered, for about ½ hour. Incorporate green beans and cook another 15 minutes until the beans are done but still a bit crunchy. Add a handful of freshly chopped basil and serve. Kushi, Michio. The Macrobiotic Way. Avery, 2004. Pitchford, Paul. Healing With Whole Foods. North Atlantic Books, 2002. Turner, Kristina. The Self-Healing Cookbook. Earthtone Press, 2002. When I think of chocolate, I picture rich and creamy dark chocolate bars from Equatorial climates all over the world. Chocolate makes a great addition to savory dishes as well, such as the mole poblano sauce I enjoyed at Jardin Escondido in Vilcabamba, Ecuador. As this precious fermented food becomes more globally available, I remember my grandfather, who only enjoyed chocolate once a year on Christmas day. When I savor cacao, I try to honor its source and all the work required to get it into my kitchen. Cacao beans, once harvested, fermented, and roasted, are a particularly potent source of healing antioxidants. Georgetown University studies have also shown that flavonols, antioxidants found in chocolate, help lower your levels of "bad" LDL cholesterol and boost "good" HDL cholesterol. They ease inflammation and help prevent clotting and arterial plaque formation. Natural unsweetened cocoa powder has the highest level of cocoa flavonols and is the healthiest form of chocolate. Try to buy organic, Fair Trade–certified cocoa powder. Fair Trade certification aims to protect farmers in developing countries from exploitation by large corporations or from price fluctuations for commodity crops. In order to be Fair Trade–certified, companies are required to pay farmers a fair price for crops, enabling farmers to pay their workers a living wage, avoid using child labor and practice environmentally friendly farming methods. Adding cocoa to savory dishes is a great way to get the benefits of chocolate without all the fat and sugar usually found in sweet chocolate-based treats. Email lisa[at]harmonizedcookery.com for recipes such as: Black Bean Cocoa Soup with Lime Zest; Mole; Chipotle Chicken Stew; Chocolate Chile Bread; Slow Cooker Posole. It's time to gather in with friends and family, enjoying the warmth of the season. Take this time to slow down and let thoughts of work and life responsibilities take the back burner. Nourish your own heart, hearth, and the seed of your deepest desires for the year to come. These recipes have graced holiday tables in places where I have traveled. Enjoy! I have put a healthy spin on each of these traditional dishes. Place potatoes in a large saucepan, cover with cold water, and bring to a boil over medium-high heat; cook until tender, about 30 minutes. Drain potatoes, and set aside to cool for about 20 minutes. Grate potatoes using the large holes on a cheese grater; set aside. While potatoes are cooking, chop onion. In a deep skillet, saute it on medium low heat, with spices and butter/coconut oil, for about 20 minutes. Grease a cookie sheet with butter/oil. Add onions and spices to the grated potatoes. Mix well to incorporate. Drop spoonfuls of dough onto the cookie sheet and flatten with the back of a fork all around the perimeter. Bake for 25 minutes, or until crispy and golden. Enjoy with cooked winter greens, cranberry sauce and hard cheese as a holiday brunch! Cook farro in twice as much water. Cook extra for a hearty winter dinner salad if you like. Grease a loaf pan with olive oil. In a large bowl, mix hazelnut meal, flour, spices and cranberries. Make a well in the center and add milk, honey, oil, and eggs. Whisk these together, then incorporate into dry ingredients. Fill loaf pan, bake for 35 minutes, and let stand to cool about 15 minutes before turning out onto a cutting board, slicing and serving. Mix flour, spices, and coconut in a large bowl. Add the remaining ingredients, mix well, and saute on medium heat in a stainless steel or cast iron skillet. Oil the skillet with coconut oil between round of cooking. Serve with extra banana slices, a dollop of cashew butter and a garnish of shredded coconut. Drain and rinse the beans. Bring to a boil in a stock pot with in 3 times as much water. Cook on medium high for 25 minutes. Skim off any foam that rises to the top. Meanwhile, chop all vegetables. Saute together in a wide, deep skillet on medium heat for 15 minutes. Add spices, reduce heat, and add beans once they are cooked. Add 1 cup water and stir to incorporate. Crack eggs in a circle over the surface of the beans and vegetables. Cover and cook on low heat for 10 more minutes. Heat corn tortillas for 2 or 3 minutes in a 200 degree oven. Place 2 tortillas on each plate, cover with beans and eggs, and serve with a garnish of cilantro. Do you have a food tradition that you love and appreciate? Research it, prepare it and serve it this holiday season. Email me and let me know how it turns out! Delight yourself and your loved ones with the gift of nourishment this holiday season. Place figs, bourbon and 4 cups boiling water in a large, heatproof bowl; cover surface with a plate to submerge figs. Let sit until figs are plump, about 1 hour; set aside. Heat cardamom pods in a saucepan over medium-high heat until fragrant, about 5 minutes. Add figs with their soaking liquid, salt, lemon peel, and juice. Bring to a boil and cook, stirring often, until mixture has thickened, 20-25 minutes. Divide finished compote into prepared half pint jars, apply clean lids and rings and place in an oven, heated to 180 degrees and turned off immediately before adding jars. Let stand in closed oven overnight. Voila! These will last on the pantry shelf for 8 months. Chop 2 large yellow onions. Enjoy with biscuits, on toast or as a dip for carrot and celery sticks. This makes a lovely appetizer with nut and seed crackers. Preheat the oven to 350 degrees. Grease a loaf pan and a mini loaf pan. Whisk the flour, baking powder, baking soda, salt, cinnamon, nutmeg and ginger in medium bowl to blend. Whisk the maple and oil in large bowl until well blended. Whisk in the eggs one at a time. Add flour mixture and stir, and whisk until blended. Stir in carrots, 1 cup of walnuts and raisins. Bake for about 45 minutes for the loaf and about 30 minutes for the mini loaf. Remove from oven and let the loaves rest in their pans for 10 minutes. Turn out onto rack and wait until cool to frost. To assemble, spread a light layer of frosting onto each loaf, swirling decoratively. Sprinkle with the remaining toasted walnuts. This frosting is amazing with the cupcakes below, too! Try it and see what you think. Grease the bottom and sides of a muffin tin (or loaf pan, if you're so inclined). In a medium bowl, combine the flours, baking powder, baking soda, cocoa and spices and set aside. In another bowl, combine the egg, mashed bananas, applesauce and butter. Add the wet mixture all at once to the dry mixture and stir until just moistened. Bake in the prepared pan for about 20 minutes for muffins (50 to 55 for a loaf), or until a toothpick inserted in the center comes out clean. Cool in pan for 10 minutes then remove. Combine flour and salt in a bowl. Cut in the butter using a pastry cutter, fork or your hands. Mix and crumble together until the mixture resembles coarse meal. Add the ice water 1 tablespoon at a time, tossing and stirring with a fork until it just holds together. Wrap in plastic wrap and let rest in refrigerator at least a half-hour. Remove and let warm up a bit, about 5 minutes, before you roll it out. Toss apples with the blueberries, flour, lemon juice, cinnamon, salt and maple in a large bowl. Roll out 1 piece of dough into a 12-inch round on a lightly floured surface with a lightly floured rolling pin. Fit into a 9-inch pie plate. Trim excess dough, leaving a half-inch overhang. Roll out remaining piece of dough into an 11-inch round on a lightly floured surface with a lightly floured rolling pin. Transfer filling to pie shell. Cover pie with the top dough. Press edges together, crimp and then trim excess. Cut 2 vents in top crust with a sharp knife. Place the pie on a baking sheet and bake for 20 minutes. Reduce oven temperature to 375 degrees. Continue to bake until crust is golden-brown and filling is bubbling, about 50 minutes more. Cool pie to room temperature before serving. Boost immunity, gain some afternoon energy, and tonify your adrenal and endocrine system with these healthy snacks. They're great after-school snacks, too. Combine the dates, tahini, coconut oil, and cardamom in a blender or food processor. Transfer the mixture to a parchment-lined loaf pan (or another equivalent container) and use a spatula to press it down evenly. Freeze until firm. Remove from the pan and cut into bite-size pieces. Store in an airtight container in the freezer for up to a month. Boil 2 cups water. As water boils, coarsely chop all dried fruit and place it in a small mixing bowl. Pour boiling water over fruit. Soak for 15 minutes and drain. Meanwhile, mix honey, nut butter, coconut, cinnamon and salt in a medium mixing bowl. Chop walnuts/almonds and pumpkin seeds. Toast all seeds and nuts. Add to mixing bowl and mix. Add soaked dried fruit to the above ingredients. Oil a glass baking dish: 7×11″ is a good size. While the mixture is still warm, press it flat into the dish with wax paper. Chill for 1 hour. Cover with plastic wrap or store in baking dish in the fridge. Keeps for 2 weeks refrigerated. Add coconut and nuts - mix in well. Mix in enough coconut to make dough thick. Autumn is here, with cool, misty mornings and pink sunsets streaking the evening sky. It feels hard to get our of bed sometimes! Once I get up, I try to step outside, look up into the sky, and breathe deeply. Even if it is cold outside, this practice invigorates me and whets my appetite for breakfast. Since breakfast is one of the best ways to get our metabolism going for the day, please eat it. Try these recipes to ease the transition into fall. Preheat oven to 350. Grease a cookie sheet with coconut oil. Spread onto cookie sheet evenly with a spatula. Allow to cool for 30 minutes. Slice and store in tupperware containers in the fridge for up to 1 week. Grease 8 muffin tins with vegetable oi. In a large bowl, beat the eggs until frothy using a whisk. Beat in the almond milk and coconut oil. Then, beat the flour, cinnamon and salt into the egg, milk, and butter mixture. Pour about ¾ cup of the batter into each of the greased muffin tins. Bake for 1 hour. Make a slit in each to let out steam; bake for 10 minutes more. Immediately remove the popovers from tins. Serve with cooked fruit and nuts. Roast the pumpkin whole at 375 for 1 hour. Remove from oven, cool, remove seeds, and scoop flesh out into a stock pot. Add all the other ingredients and simmer on medium heat, stirring occasionally, for 10 minutes. Pour into a glass container to cool and set if you like. This dish will keep in the fridge for up to 1 week. It's apple season. In Vermont, the wild apples are lining the roadsides, ready for gleaners to scoop them up and make sauce or cider. These fragrant fruits have excellent medicinal value and help us transition into fall and winter. Apples contain polyphenols and fiber to help prevent blood sugar spikes. They provide pre-biotic compounds that support intestinal flora and ease gas and bloating. Apples also contain antioxidants that help to digest fat in the cell membranes and reduce the risk of cardiovascular difficulties. These lovely fruits, in the malus genus, are part of the Rosaceae family, to which roses also belong. Thus, it is no wonder that apples enliven our hearts and uplift our spirits. 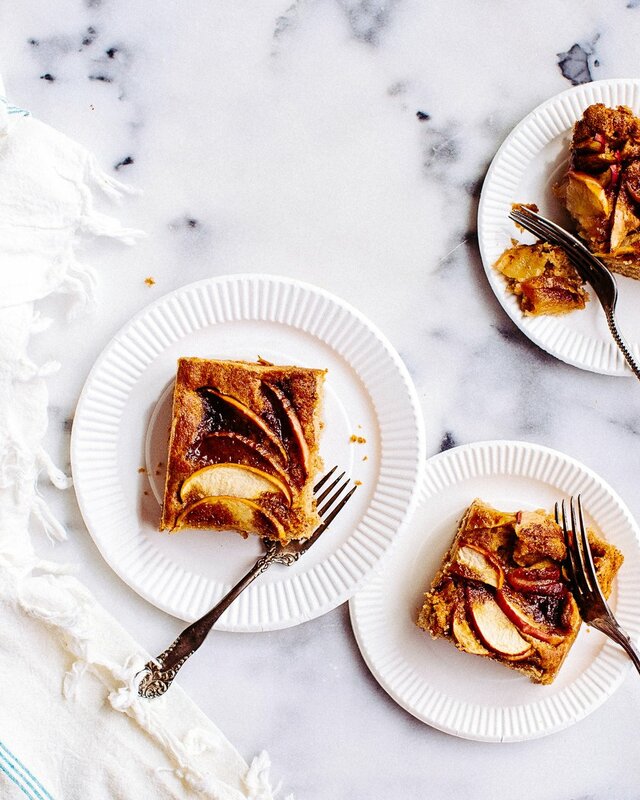 Enjoy these apple recipes and ease into fall. This tart is gorgeous and delicious. Sweet, savory, and fragrant, it is perfect for any meal. Grease a pie plate with olive oil and set aside. Grind millet in a coffee bean grinder to produce a grainy flour-like consistency. In a mixing bowl, combine almond meal, millet flour, salt, and spices. Make a well in the center, add olive oil, lemon juice and almond milk, whisk together, then incorporate with dry ingredients. Press into pie plate. Make sure that the crust gets up the sides of the plate and that the thickness is relatively even all around. Bake the crust for 10 minutes, then remove to prepare the filling. Add the onions, salt, and pepper and cook, stirring occasionally, for about 10 minutes. Reduce the heat to very low and cook, stirring occasionally, until the onions are golden, for about 15 more minutes. Set aside to cool. Meanwhile, in a medium bowl, whisk together the eggs, almond milk, and nutmeg. Peel, core, and thinly slice the apple. Pour the egg mixture into the pie crust and arrange the apple slices decoratively on top. Press on the apples to slightly submerge them. Bake until the top is lightly browned and the center is set, about 30 minutes. Let the tart stand for 10 minutes before slicing and serving. Onions: strengthen lungs; anti-microbial; anti-bacterial; offer rich source of fructo-oligosaccharides, which stimulate growth of healthy bifidobacteria and suppress the growth of potentially harmful bacteria in the colon. wash 1 bunch kale or collards. Chop length-wise. Coat the bottom of a skillet with olive oil. Grate ½ inch fresh (or frozen) ginger root into skillet. Chop 2 cloves garlic and add to skillet. Turn heat to high and sauté onions and ginger for 2 minutes. Reduce heat to low and add greens. Grate 1 granny smith apple (rinsed, with skin on) and add to skillet. Pour 2 Tablespoons water over vegetables and cover with lid. Simmer for 10 minutes, stirring occasionally. Taste for salt before serving. Choose 4 medium red beets for a 9x13 glass baking dish. Chop beets in half, first length-wise then width-wise. Then, chop each section into cubes. Throw cubes into baking dish after they are chopped. Pour ¼ cup olive oil over the top and toss with a spatula until beets are coated well. Slide dish into oven and bake for 20 minutes. Remove dish from oven and toss with spatula. Bake for 15 more minutes, cool and enjoy alone or as a soup garnish. Dark, leafy greens: collards and kale are rich in folic acid, calcium, and fiber. Place ½ cup dry kasha (buckwheat groats) and 1 ½ cups water in a stock pot. Grind flax seeds then sunflower seeds in a spice/espresso bean grinder until they reach a flour-like consistency. Place in a mixing bowl and add the coconut oil, cut into pearl-sized chunks. Add spices, salt, baking powder and baking soda and mix well. Incorporate the cooled kasha and then the lemon juice. Drop mix in heaping spoonfuls on a greased glad baking dish. Bake for 20 minutes, or until the edges have turned dark brown. Kasha (toasted buckwheat groats): rich in the flavonoid rutin, buckwheat woks to lower lipid content in the bllodstream, thus helping maintain smooth blood flow. Buckwheat also contains almost 86 milligrams of magnesium in a one-cup serving. Magnesium relaxes blood vessels, improving blood flow and nutrient delivery while lowering blood pressure. Coconut oil: saturated fat, solid at room temperature, is a plant-based alternative to saturated animal fats. It stimulates brain function and promotes intestinal motility; its anti-bacterial benefits make it an important fat to choose during times of illness or infection and is specifically indicated for combating intestinal parasites.